Everyone knows the roof of their house is important, but it's easy to forget just how important until something goes wrong. Don't wait until there's a roof leak, torn shingles, or other damage to think about the condition of your roof. Another time to schedule a roof inspection is after a severe storm. By taking care of basic roof maintenance and making minor roof repairs as required, you can avoid roof leaks that can damage your home and ruin your possessions. Additionally, if you don't catch problems right away the cost of repair can often skyrocket By catching problems early you can keep costs down and get the best value for your buck. Whether you are looking to fix a damaged roof, upgrade the look of your home with new roof installation, or replace missing or broken shingles, the expert team of roofers at Complete Home Solutions of Maryland can help. Our roofing services are available in and around the D.C. & MD area. When we evaluate the condition of your roof, our primary concern will be the roofing shingles or other finished roofing material. 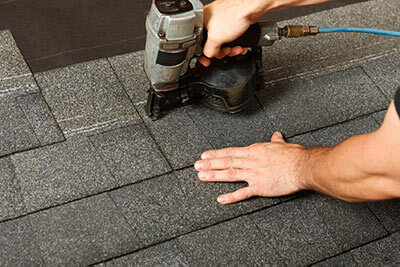 However, before deciding whether roof repair orz new roof installation is right for you, there are some other areas of the roof that should also be inspected by a professional roofing contractor. The functional condition of your roof is obviously your first priority. There are various reasons for a new roof, but many homeowners elect to have new roofing installed before the old roofing wears out, simply because a new roof can really upgrade a home's appearance. As experienced, professional Maryland roofing contractors, we can help you decide if roof replacement or installation makes sense for your needs and budget. If you are considering a roof replacement, there are some exciting new roofing materials available – like composite shingles that look like old-fashioned roofing slates but are made from recycled rubber. Modern asphalt-fiberglass shingles have never looked better – especially the architectural grades that show off extra depth and texture. Best yet we can provide many of these materials at an affordable cost so you can get the best value for your home. Over time, all roofs wear out and will eventually need to be replaced. If you wait too long to repair or replace the roof, you can end up with leaks and expensive damage. On the other hand, replacing the roof too soon is a waste of money. It's important to be aware of the common roofing problems and which ones should be dealt with right away so you can get the best value out of your hard-earned money. The professionals at Complete Home Solutions can assess the condition of your roof and determine any early signs of roof failure. We'll help you catch the signs early when the cost of repairs is still low. Contact us today for a free estimate in MD, including D.C. & MD and surrounding areas.